Please provide the following information and submit via a Word or PDF via e-mail to: info@momsorangecounty.org. 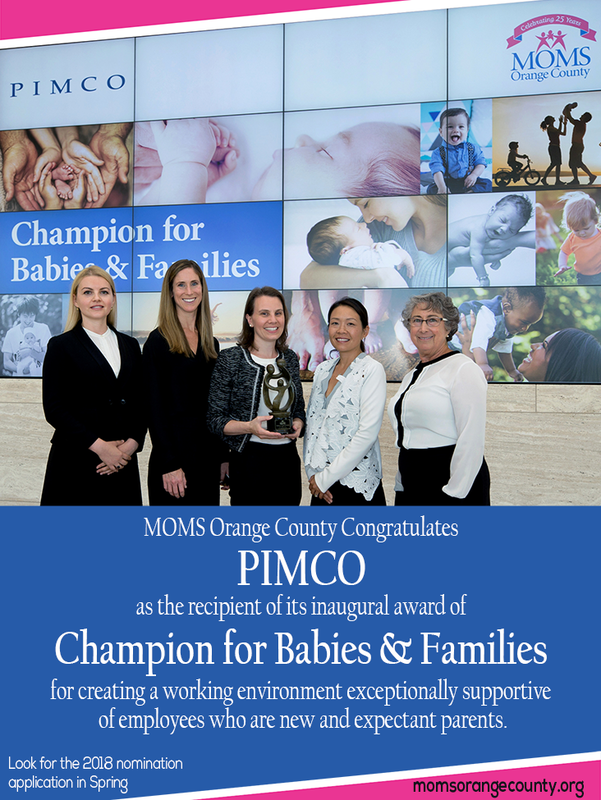 MOMS Orange County recognized Newport Beach-based PIMCO as the first corporation to receive this honor for the company’s outstanding support of expectant employees, employees who are new mothers and fathers or caregivers, and who are returning to work at the investment management firm. As part of the PIMCO Families program, PIMCO offers extensive benefits and support for employees transitioning into parenting (either through adoption or birth), as well as for employees who are caregivers. These benefits include a parental leave guide for employees who are expecting via adoption or birth that outlines benefits and a checklist for leave, expectant mother parking, five Mothers Rooms with a private space for pumping, hospital-grade breast pumps, a refrigerator, sink and reclining chairs. In addition, PIMCO’s New Expectant Mother Support Team (NEST) pairs two experienced mothers with one new/expecting mother to answer questions related to work issues and to create a support system around her. They also offer educational events for new parents that feature guest speakers, subsidized emergency back-up child care that includes center-based or in-home care, matching funds for dependent care flexible spending accounts, and gender-neutral paid leave that is fully paid for 16 weeks for the primary caregiver and for three weeks for the secondary caregiver. To top it off, each new parent receives a basket with many of the necessities a new parent might need.